in minutes - engage, interact and enhance customer experience. Beacons that run Bluetooth marketing campaigns, in minutes - engage, interact and enhance customer experience. Beacon marketing is a proximity marketing channel used by businesses to interact and engage with consumers at strategic locations. This communication is triggered by a tiny hardware device known as Bluetooth beacon. These devices transmit location-triggered rich notifications to smartphones nearby. Have your own business app? Integrate our iOS and Android app SDK with your business app to start delivering proximity-triggered rich lock-screen notifications. Looking to build your beacon app? Our latest partnership with Shoutem, a DIY app builder allows you to create iOS and Android beacon apps in a few easy steps - create a beautiful app using the drag and drop builder, integrate the Beaconstac extension and publish the beacon app on App Store or Google Play. Want to use an existing beacon app? NearBee, our beacon app initiative is designed to help businesses that do not have an app. It is a hardware agnostic app that scans for all beacons in range. Leverage NearBee to interact with your customers. Reach out to consumers nearby with contextually relevant beacon notifications. With pre-configured BLE beacons, getting started takes almost no time at all. Create, manage and monitor beacon campaigns all from an easy-to-use web platform. End-consumers receive beacon marketing campaigns on NearBee ( iOS & Android ) when they are in proximity to the beacon. 3. Send beacon notifications to consumers nearby - use NearBee or your brand app. Setting up a beacon marketing campaign using Beaconstac involves three steps - deploying, creating a proximity marketing campaign and finally delivering the campaign on a consumer’s smartphone. Beacons have to be deployed in strategic locations to ensure smooth engagement with consumers. Also, the beacon range has to be calibrated in a way that it does not interfere with the experience of the adjacent product. For eg, let’s consider beacon deployments at an iPhone store. The use case is to inform consumers about the best of each iPhone model. In this case, the beacon range has to be calibrated in a way that the information about iPhone X is confined to this physical range. A consumer looking at iPhone 7 should receive information about this model and not iPhone X (unless the goal is to upsell). Other factors to be kept in mind are, where should they be deployed, at what height, what signals could interfere with beacon signals and more. Here are some best practices for beacon deployment. Campaigns are as effective as their landing pages. With Beaconstac’s platform, you can create quick landing pages, which we call markdown cards. You could use one of the pre-designed templates or build from scratch - neither of them requires a developer. The platform also lets you create beautiful and fully functional forms for collecting feedback from your customers. If you already have a social media campaign or a campaign website that you want to direct users to, you could do that as well. The dashboard also allows you to measure and fine-tune your campaigns using the analytics engine. Let’s walk through what happens when a user walks into a beacon zone. Beacons deployed in stores, airports and other business locations continuously transmit Bluetooth Low Energy signals in its range. The beacon range is calibrated as per the use case. It ranges from 10m to 300m. Beacon-powered apps are capable of scanning these Low Energy signals. Once these apps detect the beacon signal, it finds the ID attached to the signal. The smartphone refers to the cloud server using the ID and fetches the action linked to it. This action could be notifying users about a deal, a feedback form or the business website. These notifications are rich in-app notifications that open up a campaign - a markdown card, a form or a website. This beacon-powered app can your brand app or a third-party beacon app, such as NearBee. What sets Bluetooth beacons apart from other proximity marketing technologies is the rich and personalized experience it provides. While most other proximity marketing channels require consumers to take the first step - tap (in case of NFC) or scan (in case of QR Code), Bluetooth beacons push campaigns to consumers in range. The whole point of proximity marketing is to ensure that the end-user finds the campaigns relevant. Without an app, it all becomes too easy to forget the consumer. This results in bombarding consumers with irrelevant messages. With an app in the picture, consumers choose to receive marketing content. 2 in 5 consumers like to receive targeted ads and location plays a huge role in relevance. Whether they choose to download a brand app or a third party beacon app to get notified of all the businesses in the vicinity, their experience is bound to be more tailored and rich. 70% of millennials try out new apps every month. 1. Do you already have an app? If you already have an app, Beaconstac provides an SDK (a single line of code) that can be integrated with your app to scan beacon signals and display beacon campaigns. 2. Are you looking to build an app with beacon scanning functionalities? If you are looking build your own iOS and Android app, Beaconstac has partnered with one of the leading DIY app building platforms - Shoutem, to provide a seamless way of creating beacon-powered apps. This platform allows you to drag-and-drop your way to creating polished iOS and Android apps in minutes. To top it up, you can leverage the Beaconstac extension to add beacon functionalities. 3. Do you want to use a popular beacon app, designed for this purpose? 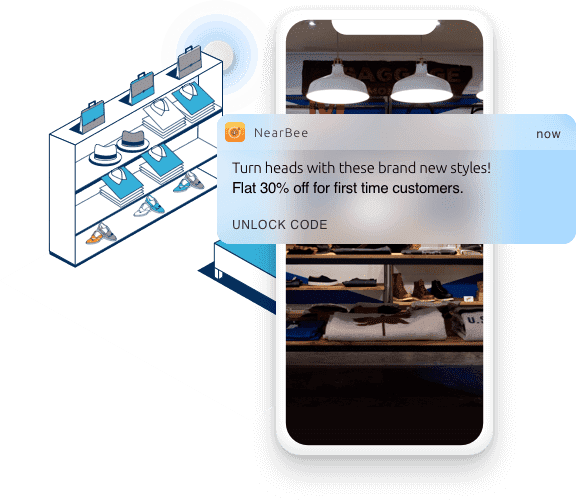 NearBee, is Beaconstac’s initiative to deliver proximity marketing campaigns without a brand app. NearBee scans and displays beacon campaigns, irrespective of whether beacons are bought from Beaconstac or not. NearBee acts as your business app when in your premises. This means that the app morphs its colours, logo and skin to suit your business. Why is beacon technology effective? Why is it appealing to marketers? Bluetooth beacons are vastly superior to legacy advertisement channels. Average open rates for standard push notifications are 7.8%. However, targeted and rich beacon notifications have an open rate of 22.5% on an average (open rate for brand app beacon notifications- 30%, open rate for third-party beacon notifications - 15%). Companies are turning away from traditional forms of advertisement and are looking more favourably towards proximity marketing solutions, as a means of sending more relevant and contextual messages to a targeted audience. 1. Beacon marketing allows advanced personalization: While a consumer is in front of a display of children’s swimwear and beach toys, their phone lights up with a coupon for 20% off on beacon toys today only, or with a notification that beach games is just two aisles down. Targeted campaigns like these see high click-through rates, enhances the customer experience and hence have excellent ROI. 2. Beacon marketing is accurate: Bluetooth beacons provide a more accurate location compared to WiFi or GPS. 3. Better customer insights: Beacon marketing using Beaconstac is analytics-driven, which means marketers can also measure campaign performance to fine-tune them. 4. Pro-longed connection with customers: Bluetooth beacon marketing also allows marketers to establish a deeper connection with customers by retargeting them on Facebook and Google. Enhance in-store customer engagement and bring them back using beacon marketing. For retail marketers, beacon marketing means reaching shoppers at the right time with the right message (offers/ promotions/ deals). Beacon technology is already used by some of America’s top retailers, including Macy’s, Target, Urban Outfitters CVS and more. Beacon marketing has proven success with spas and salons, restaurants and coffee shops, car dealerships, supermarkets and other mom-and-pop retail stores. Navigate users to a property, engage with them when inside the premises or distribute digital business cards to interested buyers with beacon marketing. Realtors like Makelaardij Hoekstra, Redfin, Mobile Doorman, Spicerhaart land and new homes and A Vendre, A louer use beacon technology to engage with interested buyers.